Aisle displays are sold as components. 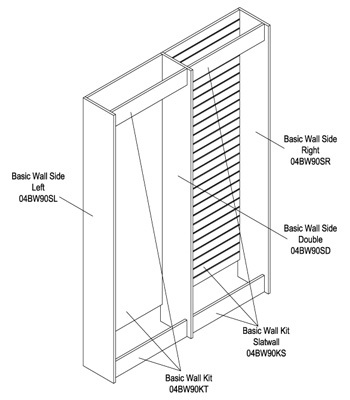 There are three types of end panels; Slatwall, Solid and Single Sides. If you would like to be able to merchandise the end of a run of aisles you would select a slatwall end. If the end of a run of aisle fixtures butts a column or is otherwise obstructed use a Solid End or a Single Side. Solid Ends are squared off and Single Sides taper to the top (Excluding 06 Series which have only squared off panels). Double Panels connect (Link) the displays together. Kits make up the interior of the display and consist of a back panel (Standard is Black) and two toe kicks and are available in 29-1/4” and 24” widths. You can essentially make a run of fixtures as long as you like by adding Kits and Double panels. All of our different types of aisle dislays multi-link. Most of our fixture types accept more than one type of shelving. For this reason shelves are sold separately in most cases. Our Wall displays are sold as components. 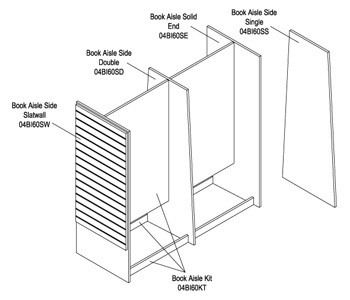 There are three types of side panels; Left Sides, Right Sides and Double Sides. Each run of wall fixtures must have a left and right panel. To increase the length of a run of fixtures simply add Kits and Double Sides. Kits are the internal parts of the display and consist of a back panel (Standard is Black) kick and fascia and are available in 29-1/4” and 24” widths. Wall kits are also available in a slatwall back version (Standard is Black). You can essentially make a run of fixtures as long as you like by adding Kits and Double panels. Our 04 wall units accept all the types of shelves we offer and are sold separately.